You are at:Home»Carriers»What's in a name? 2. USS Thomas J. Whitmore — President Whitmore displayed exceptional leadership during the 1996 alien invasion of the world. Whitmore, who lost his wife in the struggle, rallied the world and launched a successful July 4 aerial counterattack against the alien invaders, coordinated via Morse code from Area 51, Nev. He also delivered the single most inspirational presidential speech of all time, shown in the documentary Independence Day. 3. USS Your Name Here — Because everyone is special. 4. USS Navy Times — I mean, there’s always a chance. There needs to be a USS Ranger, it was after all Captain John Paul Jones who commanded the first, then the first ship built from the keel up was USS Ranger CV4. I have to go along with 1. steeljawscribe. I served on the USS Sicily CVE 118 in 1948 and 49 and my Son served on the Enterprise CVN 65 so in the 50’s we are partial to CV’s. It should replace the CVN 65. I think it should be called USS NAVY SPOUSE. I agree with the ship should be named Enterprise. Unfortunately, as lame as the Navy has been with ship names, (cough, Murtha, cough) it will go for some mediocre politican, at best. I also agree with carrying on with the old carrier names, but as has been said that would be to easy and not political enough. What about the USS Robert E. Lee CVN 79. I am not a southerner not would I have been on the side of the south, but all that I read about him indicate that he was a real gentleman and did bring an end to that war. It would also give our southern brothers and sisters a bone, for once. Each should be done in chronological order leading to the final battle of the Revolutionary War: YORKTOWN where we defeated the British, with some help from France. USS Constellation CVN 69. One of the original six frigates – the second to be launched. War proven, plus she was also a previous carrier. To go with the last input, why not USS Congress? I say go old school with presidents and go USS Thomas Jefferson. Also, too bad there won’t be any more ship’s ball caps like the ones in the picture here! How about an ironic nod to one of two US Army Air Corps aviators who did much to further the carrier navy through deeds: Billy Mitchell or James Doolittle. If the Navy desires to maintain a naming convention of former presidents; then I recommend James Madison. He’s the father of our Constitution (previous used name for ships) which authorized the building of our Navy. This lead to the building of the original six Frigates (one of which was named USS Constitution). President Madison also lead and authored the Bill of Rights. Seems to me we fight for the basic Rights President Madison had in mind. His leadership as president also allowed our country to survive its first series threat as a new nation; the war of 1812. I think they should name CVN-79 the USS Owen Honors. Take that Navy Brass! If it’s a politician I’d put big money on the USS Daniel Inouye. I agree with the comments that vintage Navy vessel names should be revived for usage among CVNs, and I especially agree that CVN-79 should be Enterprise. If they don’t, the name will likely be used on a new LHA, and that would be a shame. How about USS John Wayne? Am I the only one who thinks naming the 2nd ship of a class the Enterprise is a bit of a letdown? Also I think there is a very high probability of CVN-80 being named for Senator McCain. We’re going to need an Enterprise in the Fleet. I will be sorely disappointed if they let the Big E go into the scrap yard without a new one to replace here in the yards. It is a shame that, Admiral Marc “Pete” Mitscher, has never been given the honor he earned in WWII, probably the best carrier group commander that ever will be. He was Captain of the USS Hornet during the Tokyo raid by Doolittle, and lead Task Force 38 under Spruance. Most people that knew Mitscher said that the war just wore him out, he died soon after the war. The reason nobody knows his name is the old thing that if you don’t blow your own horn, nobody else will! But I am a realist, no ship is going to be name Mitscher unless they appoint me SECNAV. So, how about the USS Edward Kennedy? Well he had a past that involved water! Prediction…here is what the name will be, not what it should be. There3 have been eight naval vessels named ‘Hornet’ and now there is none on active duty bearing that great name. 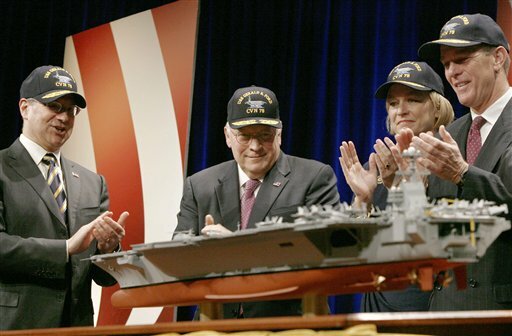 CVN – 79 should be named USS Hornet. I agree that the first priority should be ENTERPRISE. Note that there is already a BOB HOPE. ENTERPRISE couldn’t be the name for the first ship, as CVN-78 had to be named well before ENTERPRISE would be decommissioned. The previous ENTERPRISE was in the YORKTOWN class, so not that bad. ENTERPRISE definitely comes before SARA or any other previous ship name. JAMES MONROE is a good idea, as he was strategically minded, but he was not associated with the Navy. JEFFERSON would not be an especially good choice- he thought a seagoing Navy would provoke enemies- but he is better known as a champion for freedom. But neither is as inspiring for the Navy as ENTERPRISE. MITSCHER is not even close to being on a level with US Presidents. And except for NIMITZ, all Admirals have always had destroyers named for them back to DD-1. If they’re going to whore out the ship names they could at least put out a price list. Thanks for all the great suggestions, everyone! We ran a piece in this weeks paper around the ideas you all posted. Maybe Secretary Mabus will listen, who knows? Stop naming carriers after presidents. Whoever started that foolishness needs to be keelhauled! Besides, it’s obvious that we’ve run out of all the good ones, and have stepped over the boundary into the level of mediocre leaders. In fact, I suggest we re-name the Ford (speaking of mediocre presidents) the Enterprise, and then carry on the naming of future carriers in that class with the historical names already mentioned (Sara, Ranger, etc). Enterprise, Enterprise, Enterprise,then start with the other carriers. Intrepid would be a good one, my Dad served aboard her! NO MORE POLITICIANS…EVER! Especially if they have never served in the Navy! I agree with most everyone in that it should be named Enterprise and follow on with the historical carrier names. I also agree that ships need to stop being named after politicians. Most can recall him as the first man to set foot on the moon. Neil Armstrong was a quaified carrier pilot, flew over 78 missions in Korea. He was forced to eject after being hit durring an air raid. Neil Armstrong received the Air Medal for 20 Combat Missions over Korea. After leaving the Navy and following his return to Purdue, Armstrong eventually became a test pilot for NASA having flown the North American X-15. If you’re looking for a name associated with the Navy, air craft carriers, combat vetran, a test pilot, an astronaut, aerospace engineer and a historical status; then, I can think of no better name then Neil Alden Armstrong. I think a lot of the traditional CV names will be used on LHAs now, LHA-6 being the USS America sets a nice precedent for naming LHA-7 one of; Ranger, Hornet, Yorktown, Ticonderoga, Sartoga or Independence. I’d put money on CVN-79 being the USS Enterprise and -80 being the USS John Sidney McCain. Lots of fun to be had naming DDG-113/114/115 once contract issues with Huntington Ingalls is worked out. SecNav will probably be naming SSN-786/787 shortly. I listed the states with Defense Appropriations members w/o boats named for them above. If I was betting I’d go with the USS Illinois and USS Vermont. I like Carlos idea of Neil Armstrong having a ship named for him, but I’d rather go with one (or both eventually) of the USN NASA astronauts related to the Apollo 13 mission. Ken Mattingly (Gary Sinise in the movie) was a RADM and flew Apollo 16 and two Shuttle Missions.